The California Wine Club's $1 Shipping Days have been Extended! Shop now and save up to $36 in shipping on every case of award-winning wine! To keep the fun going and the wine pouring, every case and half case ships for $1, plus you can save up to 50% on award-winning wines! Enjoying handcrafted, award-winning wine has never been easier! I generally stick with the keep-it-simple policy in matching food and wine. After all, humans have been making wine for 7,000 years or more, and throughout that history, we've fashioned it as an ideal beverage for the dinner table. It bothers me that an overly finicky, demanding approach to the quest for a perfect wine-food match saps the fun out of wine appreciation. Perhaps even worse, this attitude sets a high barrier tagainst entry for those who'd like to learn more about quality wine but fear that it's too complicated and prefer to avoid the embarrassment of a public display of ignorance. My advice: Pull up a chair, pull out a cork (or pop a screw cap) and enjoy! Most wines go with most foods most of the time, and if you choose to defy "the rules" by having a Chardonnay with a rare steak or a Shiraz with Dover sole, it's not going to be toxic or even unpleasant. Sure, getting into serious wine and food matching can lead to some delicious combinations, and ignoring the conventional wisdom can lead you to some odd combinations. But why should wine be any different than food? Most of us would instinctively avoid serving pickles on ice cream, or chocolate-covered chicken (with a strong exception for Mexican mole there), without worrying about learning complicated rules governing which foods may be partnered on one plate. The best rules, again, are the simple ones, subject to nuances that you figure out for yourself based on what you've tried and liked. Toss out that Book of Wine Dogma. It will only mess you up. 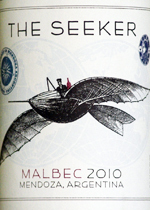 I'm thinking about my dinner the other night with an Argentine Malbec, the 2010 offering from Kobrand Corp's "The Seeker" portfolio. I've enjoyed other "Seeker" wines including the Pinot Noir, so I was a bit surprised to crack this one's screw cap and find a big (14.5% alcohol), oaky and fruity "international-style" wine. This is a style that many enjoy, including some of the Big Name critics, but I tend to veer away from these bruisers in favor of more subtle Euro-style wines. At this point, though, it was time for dinner and the bottle was open, so I wasn't about to waste it. What's more, Kobrand's fact sheet specifically recommended experimentation! "Perfectly matched to cured or grilled meats, game, Cajun and Indian-style foods, and tinkering with creations...never mind the crash." That's an attitude that I like. As a matter of fact, I had an Indian-style dinner under construction, or Turkish-style to be precise, but who's looking? The summer's first eggplant and tomatoes from the garden had gone into a dish of Imam Bayildi, a garlicky, robust Southwest Asian treat that ought to match up with a big red at least as well as spaghetti with tomato sauce would. So, how about some cheese? After dinner we broke out a chunks of Sapori d'Italia Noce, a Tuscan-style Kentucky goat cheese studded with bits of walnut. Now we're talking. The creamy fat in the cheese seemed to coat the palate in a way that pulled a velvet glove over the wine's raw power, and the combination made the second glass more pleasurable than the first. At 14.5% alcohol, there wasn't going to be a third glass. Moral of the story? If I had been obsessed with food pairing, I probably wouldn't have served a huge Malbec with Imam Bayildi. But why worry? Dinner was fine, and I got a few more mental notes about what works and why. You'll find my wine tasting report below. Some of you reported difficulty with the Wine-Searcher.com link to last week's featured wine, the Famille Iché 2010 "Les Hérétiques" Vin de Pays de l'Hérault. Try this simpler link, and don't worry if some of the "hits" go to a Chateau d'Oupia label; that's Famille Ichés property. Shop now and save up to $36 in shipping on every case of award-winning wine! Click here to get started! Enjoying handcrafted, award-winning wine has never been easier! To keep the fun going and the wine pouring, The California Wine Club has extended its 22nd Anniversary Celebration. Every case and half case ships for $1, plus you can save up to 50% on award-winning wines! *	Oreana Winery 2008 Central Coast Pinot Noir, boasting 1 Silver and 2 Bronze medals. Aromas of rose, raspberry and blackberry lead to similar flavors enhanced by rich cherry notes. Normal retail is $24 but the CWC price is $11.99. *	Margerum Wine Company 2010 Happy Canyon of Santa Barbara "Sybarite" Sauvignon Blanc, rated 91 points and named One of Wine Spectator's Top 100 Wines for 2011: "Crisp, clean and smooth, with notes of mango, melon, peach and tangerine...refreshing acidity...plenty of focus." Normal retail is $25 but the CWC price is $18. *	W. Wheeler & Co. 2009 Central Coast Sangiovese, Rich flavors of dark cherry with black plum, vanilla, and spicy oak notes. Normal retail is $20 but the CWC price is $11.99. Click here for $1 Shipping! Or visit www.cawineclub.com or call 1-800-777-4443. Some restrictions may apply. Must be 21+ to order. FOOD MATCH: Not bad with garlicky Turkish eggplant and tomato Imam Bayildi, but a powerful, fruit-forward New World red like this probably performs best with red meat - steak or a juicy burger - or robust cheese. It came into focus after dinner with chunks of Sapori d'Italia Noce, a Tuscan-style goat cheese studded with bits of walnut. WHEN TO DRINK: It won't go around the bend in the next year or two, but this style of Malbec isn't made for cellaring. Enjoy it while it's got all that fruit, then watch for a fresher vintage next year. VALUE: If you like your New World reds in the big-and-fruity style, you'll find this one a good value in the $10 to $12 range; I'd be wary about a wine shop that asks much more. The Seeker's Website is essentially an attractive ad brochure, but here's a somewhat more detailed fact sheet on the 2011 Malbec. For a brief, PR-style summary of Kobrand Corp.'s Seeker project, see this link on the importer's Website.